The "Enduring Stockpile" is the United States's arsenal of nuclear weapons following the end of the Cold War. During the Cold War the United States produced over 70,000 nuclear weapons. By its end the U.S. stockpile was about 23,000 weapons of 26 different types. The production of nuclear weapons ended in 1989, and since then existing weapons have been retired, dismantled, or mothballed. As of 2001 the Enduring Stockpile consisted of about 9,600 weapons of 10 types. As of 2004 about 3,000 of those weapons had been moved to the lowest readiness level, in which they are not dismantled, but no longer in active service. In 2004, the stockpile included 5,886 strategic warheads and 1,120 non-strategic weapons. The strategic weapons included 1,490 ICBM warheads, 2,736 submarine-launched ballistic missile warheads, 1,660 bomber weapons (strategic B61 and B83 gravity bombs, AGM-86 ALCM, and AGM-129 Advanced Cruise Missiles), and several hundred spare warheads. The tactical weapons consist of 800 tactical B61 gravity bombs and 320 nuclear warheads for Tomahawk missiles. The START II Treaty called for a reduction to a total of 3,000 to 3,500 warheads, but was not ratified by the Russian Duma. The replacement 2002 Strategic Offensive Reductions Treaty delayed reductions to 2012, with a limit of 2,200 operationally deployed warheads. The New START treaty signed in 2010 commits to lowering that limit to 1,550 warheads, and was ratified by the Russian Duma on January 26, 2011. The now decommissioned United States' Peacekeeper missile was an, in development ICBM intended to entirely replace the minuteman missile in the late 1980s. Each missile, like the heavier lift Russian SS-18 Satan, could contain up to ten nuclear warheads (shown in red), each of which could be aimed at a different target. A factor in the development of MIRVs was to make complete missile defense very difficult for an enemy country. 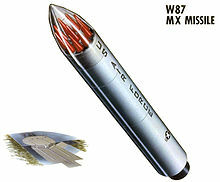 Critics from the peace movement and within the military establishment have questioned the usefulness of such weapons in the current military climate. [ According to an advisory opinion issued by the International Court of Justice in 1996, the use of (or threat of use of) such weapons would generally be contrary to the rules of international law applicable in armed conflict, but the court did not reach an opinion as to whether or not the threat or use would be lawful in specific extreme circumstances such as if the survival of the state were at stake. There are eight sovereign states that have successfully detonated nuclear weapons. Five are considered to be "nuclear-weapon states" (NWS) under the terms of the Nuclear Non-Proliferation Treaty (NPT). In order of acquisition of nuclear weapons these are: the United States, Russia (successor state to the Soviet Union), the United Kingdom, France, and China. Nations that are known or believed to possess nuclear weapons are sometimes referred to as the nuclear club. Since the NPT entered into force in 1970, three states that were not parties to the Treaty have conducted nuclear tests, namely India, Pakistan, and North Korea. North Korea had been a party to the NPT but withdrew in 2003. Israel is also widely believed to have nuclear weapons, though it maintains a policy of deliberate ambiguity regarding this, and is not known definitively to have conducted a nuclear test. South Africa has the unique status of a nation that developed nuclear weapons but has since disassembled its arsenal before joining the NPT.